The photo of this rounded corner Suede Business Card does not justify the complexity of the printed design. First, the card was designed with a grey layer that was printed directly onto the suede paper stock. Next, two separate and custom die's were created. One, for the red foil stamp, and two, for applying silver foil over the red. Using negative space, our design team connected the three layers together - one on top of the other. 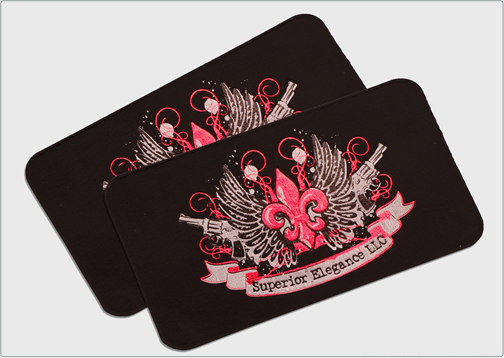 The final card provides Superior Elegance with an edgy brand on Taste of Ink's luxurious suede stock. This card may look simple to the eye but the manual treatment and finished piece is truly incredible.